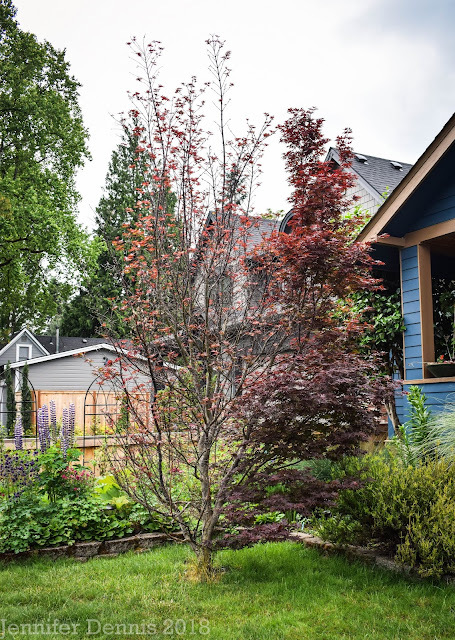 Last Sunday, I spent a delightful afternoon in the company of fellow Portland area Garden Bloggers. 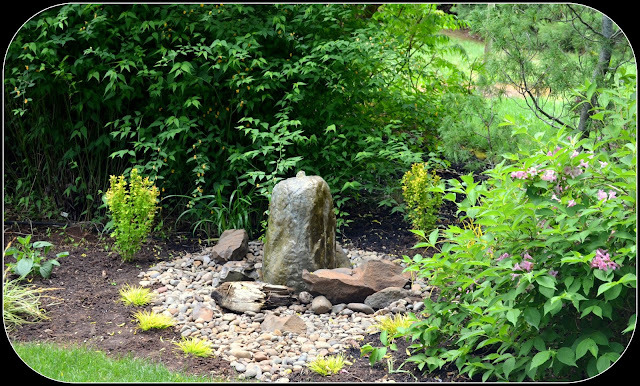 Scott from, Rhone Street Gardens, organized a trip to the Wind Dancer Gardens, home of Carolyn Kolb. Carolyn ran a nursery for over 14 years and has now moved into Garden Coaching. 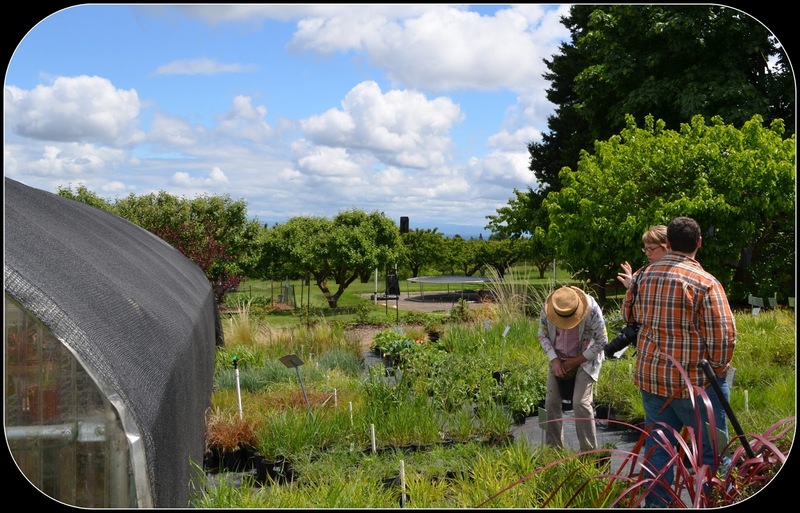 Carolyn graciously gave us a tour of her gardens and let us purchase from her remaining nursery stock, which is primarily gorgeous grasses. A 'Louie' White Pine set behind spirea and heucheras. I was delighted to finally see a mature 'Louie' White Pine. I have a baby in my own garden now. 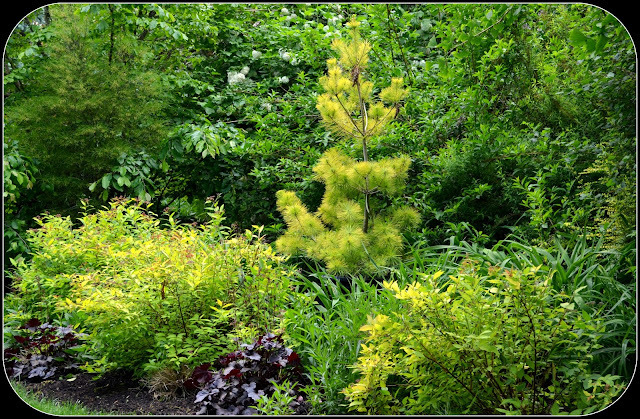 This tree is a great alternative to the popular 'Chief Joseph' pine. 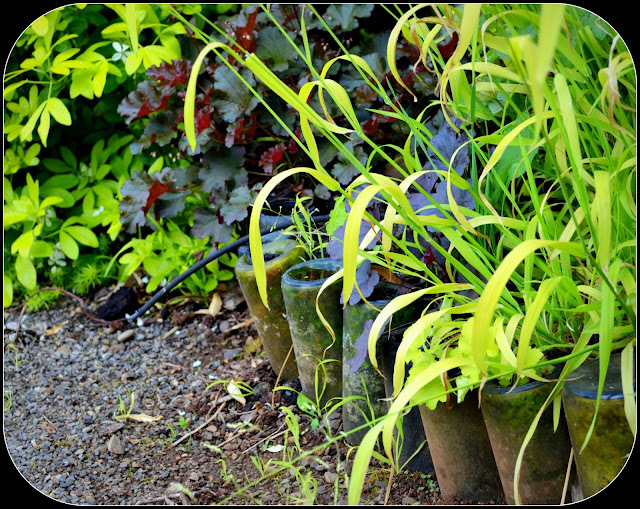 Cappuccino Sedge provides a lovely bronze hue around the containers in this part of the gardens. 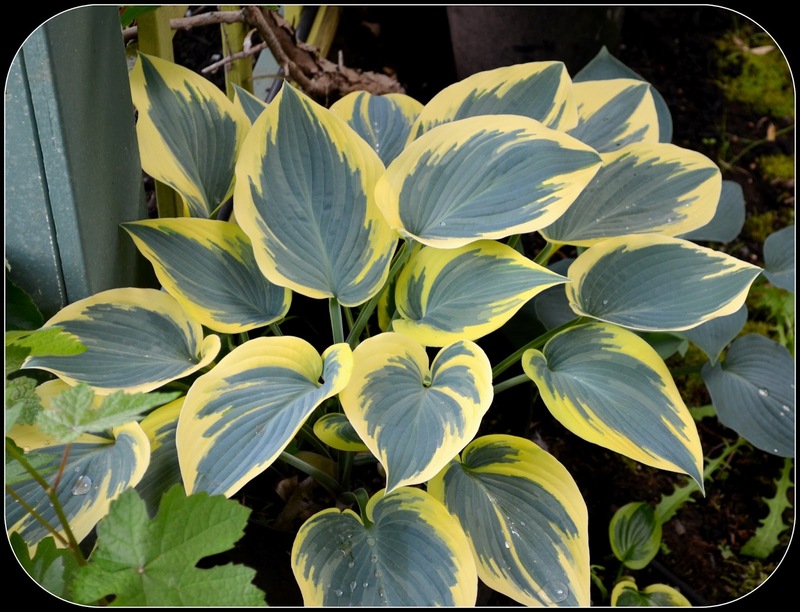 Inside the Patio, I found a gorgeous, unnamed hosta that I will have to find someday! The Path leading out of the back and into front where we loaded up our goods. How many different types of grasses can you count in this picture? 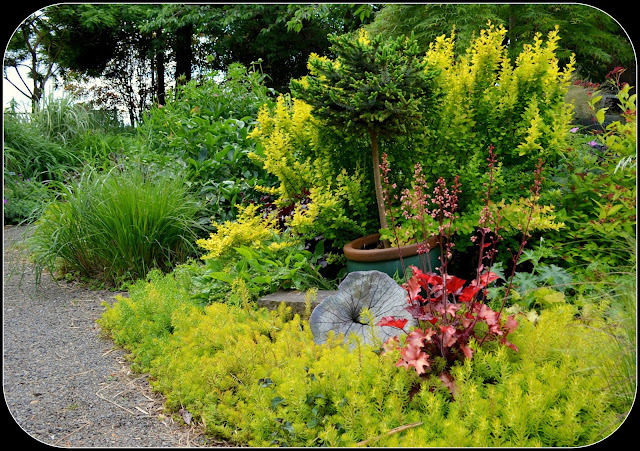 What I most appreciated about viewing Carolyn's gardens was the way she used a variety of elements to create a unique space in every turn of her gardens. 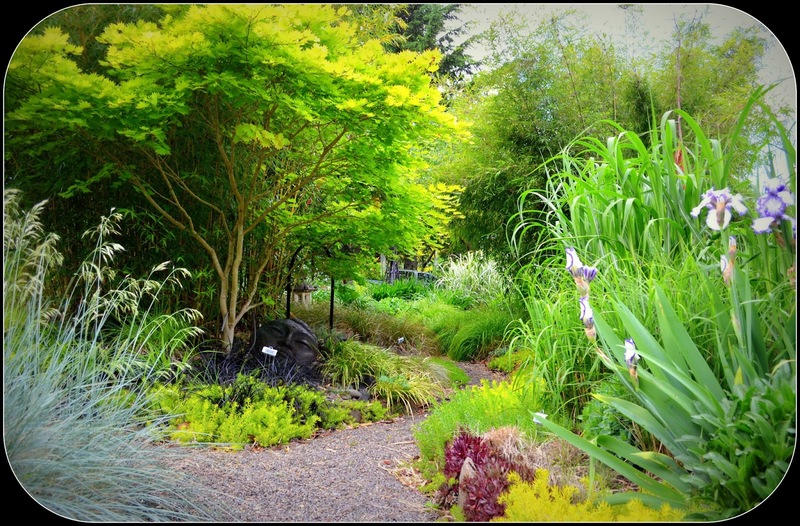 Carolyn is known in the Pacific Northwest for utilizing grasses in gardens to create texture and color in ways not common to this area. When she would describe each grass, she would talk about the way it would move in the wind, how it would look in the winter and the colors you would be graced with throughout it's growing season. 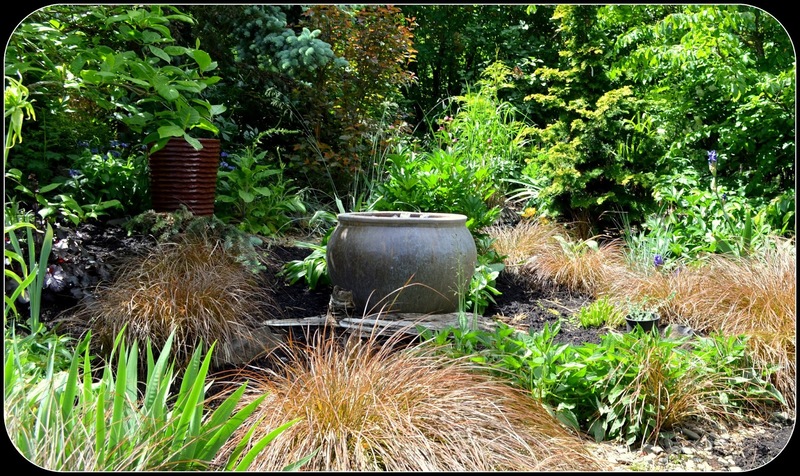 I have been very interested in adding grasses to my garden designs. I give full credit to Scott, for introducing the idea to me via his blog. Grasses create seed heads, perfect for our feathered friends in the winter and the plant can retain a beautiful structure and foliage in the garden during the non-growing months. 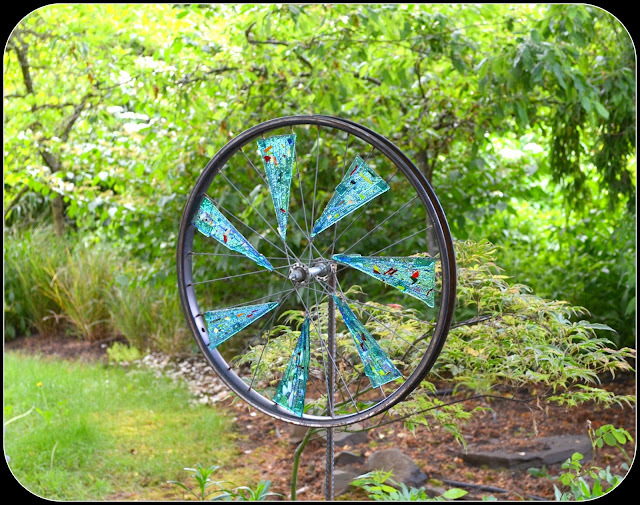 A fun piece of garden art near Carolyn's driveway, perfect for the bicycle lover! I showed great restraint and only purchased six new grasses. The back of Heather's truck was nearly loaded to the brim with all our new plants. 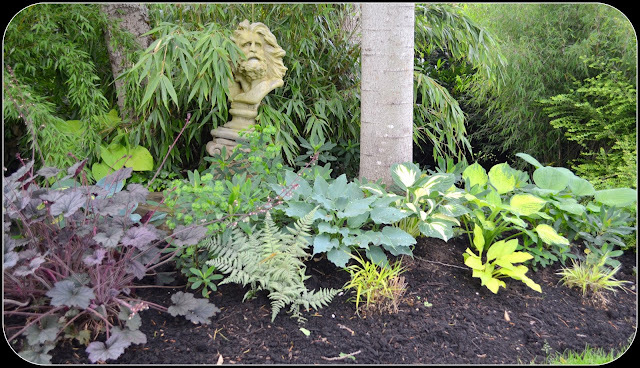 Many thanks to Carolyn for opening up her gardens and remaining nursery stock to us and to my fellow garden bloggers for making the day an event to remember. Sounds like you all had a great time together. I would so have liked to see Carolyn's gardens, and to hear her talk about each of the grass's attributes. There is so much more to consider when buying them than how they look at the moment. You didn't tell us what grasses you bought! Did she let you into the secret as to how she kept her hostas slug free? That is a winningly composed garden. Since I couldn't work the trip into our weekend, seeing this is the next best thing. Thanks! So glad I had the good sense to jump on this opportunity! While grasses aren't a big love of mine no garden would be complete without a few...and Carolyn's garden tour was worth the trip alone. Great photos Jenni! So glad for this post ! I didn't take any pics and have been regretting it. Such a lovely garden and Carolyn was so full of enthusiasm in showing us her garden . I was so glad you were able to come along, Jenni...and if you're going to get introduced to grasses, Carolyn's garden is the place to do it! BTW...what did you get...I kept trying to figure it out...but it was a little crazy when it came to dividing them up at the end! I loved the post. I miss the grasses of the prairie. There isn't much sun here to do grasses, but I may try. I really liked her bicycle wheel art. The whole place was beautiful. I'm glad you got to take such a fun road trip and brought us along. I agree with you about that Hosta. Incredibly dramatic. I'd love one. If you ever find out its name, please let us know! Carolyn's garden is certainly full of inspiration. It looks so natural, though it obviously isn't. I like that so much better than the sort of thing that has been winning medals this week in the Chelsea Flower Show - which are full of hard landscaping and too rigid and geometric for most peoples' tastes. What a great day out and Carolyn's garden is really gorgeous. What an inspirational day out. Looking forward to seeing your grassed planted up. Thank you for the beautiful tour! Great pictures. What plants did you buy? It looks like you all had a lovely time. Great tour!! 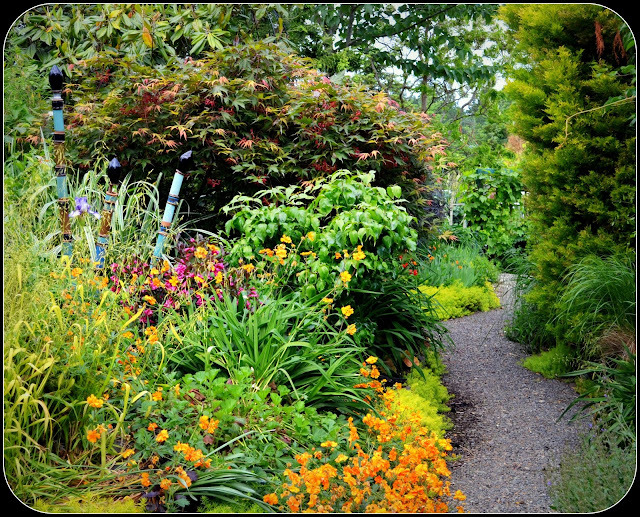 Carolyn's garden is indeed really gorgeous.